I am someone that rarely ever buys a cake from a cake shop. Why, I just hate buying something and then being disappointed with what I buy. Store bought cakes I find are generally too sweet for me. With the macaroon I was not disappointed with the flavour, but with the price, they are quite expensive. So after trying a macaroon (so that I knew what they should taste like) I enjoyed them enough to want to make them. It took me three recipes before I was happy with the end result. Others I tried would crumble too easily, so would be very messy to eat. These ones were perfect, very simple to make, easy to eat. 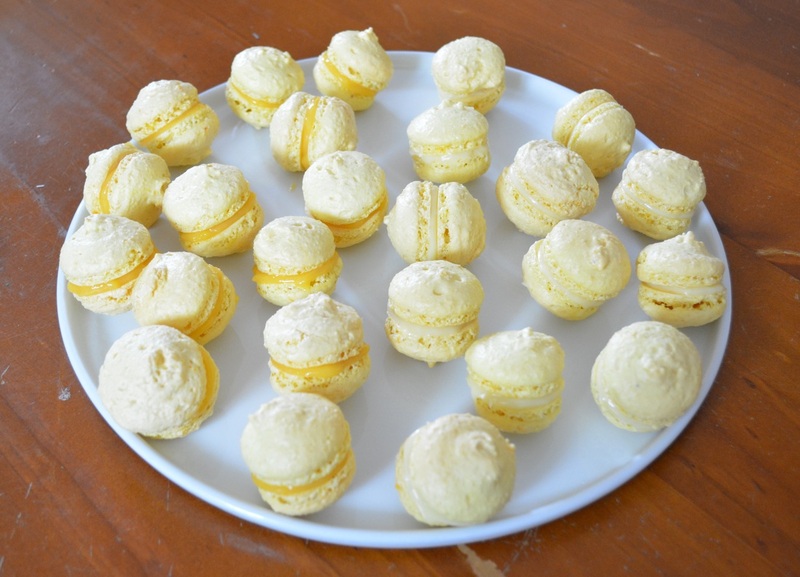 These macaroons seriously are easy to make, the hardest part is the piping to get them similar in size, but with practice that gets easier and easier. I like to make small ones, so I use a 1.5cm plain tube and make 3cm rounds, but feel free to make larger ones. You can also use a pencil to draw circles on the baking paper, to help with piping, just but the pencil side down on the baking tray so you don't get pencil on your macaroon. I haven't mastered getting them flat like the shops do, mine have a small peak on them, but no one that has tried them cares about that. Also when baking I bake one tray at a time in the centre of the oven, the macaroons that sit for more than 30 minutes before baking are just fine, they turn out perfect. The actual recipe is with a Limoncello filling, while other recipes I have tried using lemon curd. So I will give you either option as your filling. 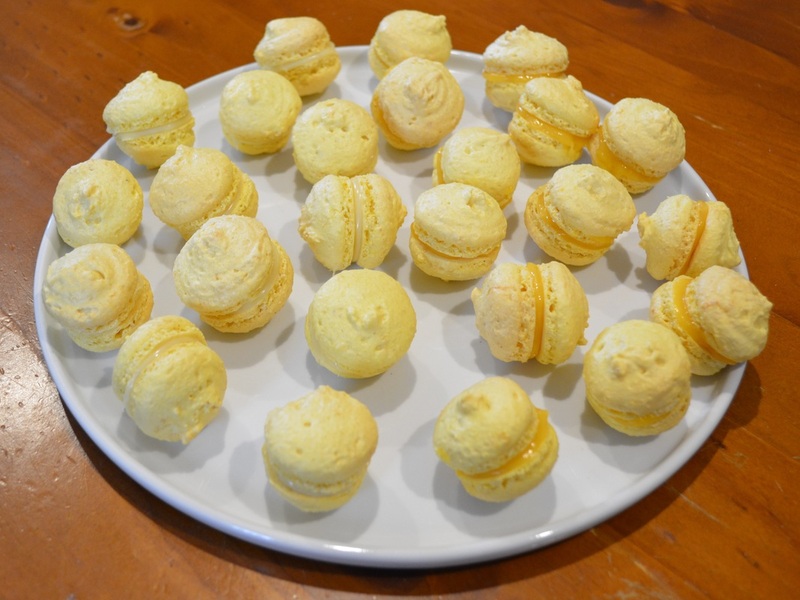 If you are going to fill the macaroons with a lemon curd filling you need to make it at least the day before, but you can make it a few days earlier. Refrigerate, until needed. Grease two oven trays, line with baking paper. Beat egg whites in a small bowl of an electric mixer until soft peaks form. Add the caster sugar and a few drops of colouring, beat until the sugar dissolves. Transfer the mixture to a large bowl. Fold in sifted icing sugar, ground almonds and lemon rind, in two batches. Spoon the mixture into a piping bag fitted with a 2cm plain tube. Pipe 4cm rounds about 2cm apart onto the prepared trays. Pick up the trays and drop them flat on the table (carefully) to allow the macaroons to spread slightly. I do this 2-3 times. Dust macaroons with extra sifted icing sugar. Stand 30 minutes. Preheat oven to 150C. Bake macaroons about 20 minutes. Cool on trays. I use a thin palette knife to ease them off the baking paper. For the Limoncello Filling: Bring the cream to the boil in a small saucepan, remove from heat; add chocolate, stir until smooth. Stir in liqueur, stand at room temperature until spreadable. (If you want to quicken the process, you can refrigerate the filling, but watch it, as it can go too hard and become to hard to spread). 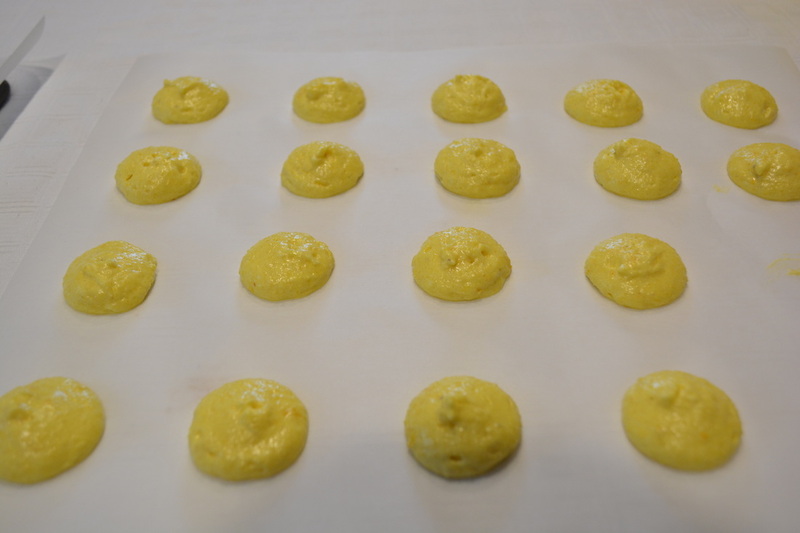 Sandwich macaroons with either the lemon curd or the Limoncello filling.